Chemistry is a study of matter, this includes learning about the physical and the chemical properties of matter. There are different types of matter such as solids, liquids and gases. Different atoms react and form molecules, molecules combine and form compounds, compounds when mixed in different proportions form mixtures. Therefore change is inevitable during reactions. When the change is analyzed it can be of two types either a physical change or a chemical change. The change which effects only the physical properties of the compound leaving the composition of the compound unaltered is called a physical change. During a physical change there are no new products formed. This means the physical change is a temporary change. These changes effect either the shape, color, texture, temperature, change in state (either due to the melting point or the boiling point of the substance), density, viscosity, malleability, solubility and any other physical property. The composition of water remains the same at different temperatures but there is a change in its physical state, hence this example can be best used to understand the physical change of substances. Water when reaches its boiling point changes to water vapor. There is a change in the state of water from liquid to gaseous state but the composition of the H2O molecule remains the same. Water when reaches the freezing point turns into ice. Here there is a change in the physical state of the matter from liquid to solid but there is no change in the composition of the water molecules. A substance can exists in three states of matter solid, liquid and gases. Solids is a state of matter where the particles are closely bound to each other. A solid substance has a fixed shape and occupies a fixed volume. The particle in a solid state do not have freedom of movement due to its rigid structure. Examples of a solid substance are wood, paper, glass, iron etc. Liquids is a state of matter where there is some space between the particles. A liquid substance has the quality to take the shape of the container it is stored within. Example of liquids are water, juices, petroleum, oils etc. Gases is a state of matter where the particles are freely spaced. There is a lot of freedom of movement between the particles when compared to the other states of matter. Hence the gases have no fixed shape. Example for the gases are water vapor, oxygen, nitrogen and many more. Boiling, evaporation Causes liquid change into gaseous state. Melting, fusion Causes solid change into liquid state. Sublimation Causes solid change into gaseous state. 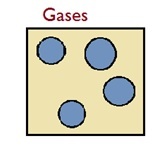 Deposition Causes gases change into solid state. 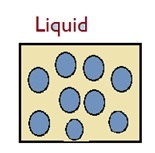 Condensation, liquefaction Causes gases change into liquid state. Freezing, solidification Causes liquid change into solid state. The change which effects the chemical properties of the compound due to which the composition of the substance changes is called a chemical change. During a chemical change there are new products formed. These changes effect the molecular arrangement of the atoms in a substance due to which the change is permanent. Example for the physical and chemical changes. Formation of ice from water. Combustion of any substance. Water boiling into water vapor. Acid and bases reacting to form salt and water. Folding of a sheet of paper. Cooking and digestion of food. Melting of the candle wax. Rusting of the iron rod. Mixing sand into a water tank. Fireworks in the sky. Cutting the glass edges. The process of photosynthesis in the plants. Melting of the ice cream. Formation of yogurt from milk. Reactions are of two types one is reversible reaction and the other is the irreversible reaction. The reaction in which the products can be changed back to the reactants by changing some physical properties of the reaction is called as the reversible reaction. The above example is an acid base reaction where the salt (NaCl) and water is formed. During a physical change the mass of the substance can neither be created nor destroyed. Hence the mass is conserved due to which the initial substance can be regained. During a chemical reaction the mass of the substance is not conserved. This implies that the mass of the initial substance can be different from the mass of the products as the composition of the substance is changed. This means the molecular structure between the atoms is changed due to which the initial substance cannot be regained.